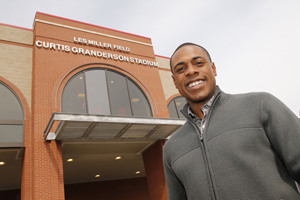 The stadium is named after UIC alumnus Curtis Granderson, whose gift is the largest known one-time donation from a professional athlete to their alma mater. UIC’s Curtis Granderson Stadium officially opened Thursday with more than 800 friends and family of UIC baseball on hand for the ribbon-cutting and the series opener against Wright State. Granderson, a Flames’ Hall-of-Famer and current New York Mets outfielder, was there to throw out the first pitch as his parents and former coach watched. “It’s neat to have my name on something that’s going to be here for a very long time,” Granderson said before the opening ceremonies. Granderson’s gift of $5 million to UIC is the largest known one-time donation from a professional athlete to their alma mater, according to Sports Illustrated. Besides its role as home for Flames baseball, Granderson Stadium will host more than 38 Little League organizations every year, bringing Granderson’s love of the game to Chicago youth. “Without UIC, I wouldn’t be standing here today,” he said. “When given the opportunity to give back and help those that have helped me, this was one of the first ways we thought about doing it. We had done a few things in previous years and this won’t be the last. The new ballpark has a total capacity of 1,784, with 1,284 fixed seats and space for 500 in the seating berms beyond left and right field. The venue has a luxury suite, press box and media suite, training room, team room and two outdoor synthetic turf practice tunnels. “This is going to be, hands down, one of the top facilities in all of baseball,” Granderson said. Granderson’s nonprofit organization, Grand Kids Foundation, promotes youth development through education, physical fitness and nutrition. He is an international ambassador of Major League Baseball, national ambassador for the White House’s anti-obesity campaign, Let’s Move!, and spokesperson for the Partnership for a Healthier America’s Drink Up water initiative.